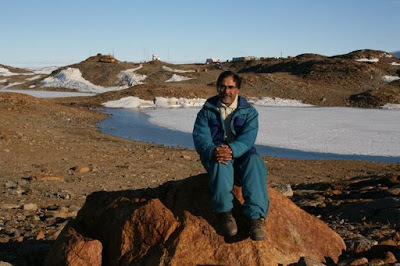 Indian Psychiatrist Blogging From Antarctica! Dr Sudhir Khandelwal, a psychiatrist engaged in research in Antarctica is blogging away and shares some useful insights into life in Antarctica despite limited internet access. Based at the Indian research station of Maitri, he is a member of the Indian Scientific Antarctica Expedition. We exchange emails through shared account. The station has installed desktop computers at many places for people to write their emails with the addresses on outlook express. Every morning, one of us downloads them on a floppy or CD to deliver it to the telecommunication room which once or twice a day connects to the ‘Amos’ server in Holland to send and receive all the emails. These are then uploaded into various desktops for people to read them. If we wish we also receive printouts too of our emails. Another limitation of this service is that we can not attach a file or photograph with our mails. Many members who either are not computer literate or whose families do not enjoy the computer or internet facility, their letters written in long hand are scanned and sent to NCAOR at Goa which then posts a printout of the same to the family of the member. It is interesting to read his Antarctica adventures and reminds us how blogging has made the world a smaller place.